All transactions are safe and secure with a reliable history in online purchasing behind each of our associates. Buy the Hangover What Up Player Quote t-shirt to own Hangover clothing and merchandise. Some things in life aren't just black and white, including a weekend with the boys in Sin City. Oddly enough, this wasn't the first time Alan randomly found a child to care for. 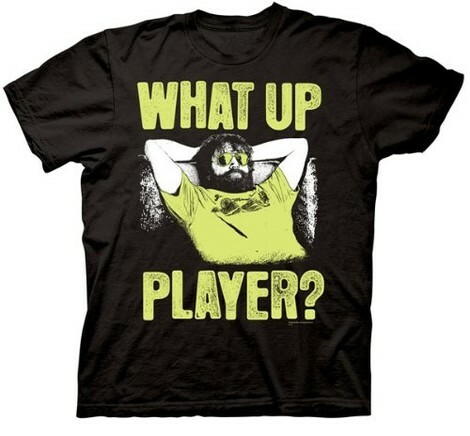 On this Hangover Zach Galifianakis t-shirt you see the quote, "What up player?" which will have you cracking up. Get this official Hangover tee and a pair of Alan's Blublocker sunglasses from the gallery so you can be a part of the pack. If you're looking for similar designs, check out our Hangover Baby Carlos shirts. In addition to the Hangover What Up Player Quote tee above, browse the Hangover Clothing Gallery for more apparel like men's and women's clothes, kids shirts or hoodies.